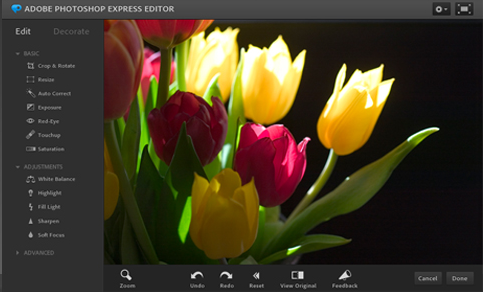 Photoshop Express Editor provides free image editing tools for you. Just as long as you are connected to the internet, you can use this free tool to edit any images. Consider this. You are away from your computer, either at a friend’s home or vacationing and you have to make some edits to a photo / image file. You can quickly make changes to the photo image by using Photoshop Express Editor as they are online based so you can make the changes even if you are away from your usual computer. One of the best things in our view, is that if you are not very technically sophisticated when it comes to editing images, Photoshop Express Editor is much more user friendly than “Full” version of Photoshop (which you have to pay for as well).